You know how when you have some annoying job around the house that needs doing and you think to yourself, I’ll do that next time I’m on holidays? Then the holiday comes and you’ve made this promise to yourself, and if you’re really silly, your wife, and so you’ve got to do it. “You’re all over it,” I replied. Damn! I’d forgotten about that. 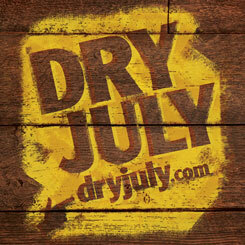 When I heard about the Dry July concept I thought it sounded great. “I’m going to do that,” I said to Tracey at the time. That was my mistake – if I’d kept it to myself I’d be having Scotch & Dry July instead. Because I want to give my liver a break. Because I want to prove to myself I can. Because abstinence makes the heart grow fonder. “Just because,” I told her. And, well, it was March when we had this conversation: July seemed so very far away. Worst thing is, I’ve even got a week off work in July which I’d normally use to polish off a carton, but now I don’t know what I’ll do. Damn! I made that promise back in February.